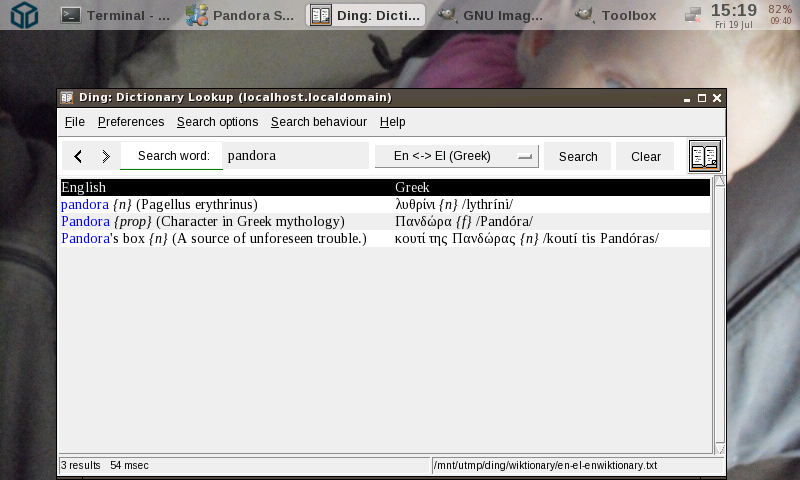 Ding (DIctionary Nice Grep) is a dictionary lookup program. It contains a very good German-English dictionary. You can use advanced matching options thanks to agrep. A lot of other dictionaries are also included in this PND. They are extracted from the English Wiktionary. @jon: was looking at the wrong agrep manual; seems that no agrep has a usable UTF accent ignoring mode (without manually building the regexes); nonetheles could you include the free TRE agrep instead? Alright, it is very nice, but only 4/5 for me at this stage because there is no word wrap on the window which makes it a pain to use for long definitions. If the original author could fix that, that would be great. If there are bugs in Ding, I could try to fix them, but I think it's better if you signal them to the original author. That way it can probably be fixed better and I can just update this PND when a new upstream version is available. Searching nÇhÇŽo gives Warning: pattern has some meta-characters interpreted by agrep! I suspect this is an error, because the result is correct otherwise.